GERMANY: Siemens has recorded profits of €137 million in its Q2 financial quarter up from a loss of €44 million in the same period last year. Revenue of its wind business also grew 16% from €1.26 billion to €1.46 billion in the quarter. A higher volume of orders, particularly offshore boosted the earnings, said the company. 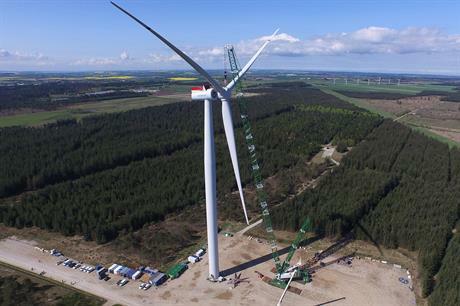 In the quarter, Dong Energy confirmed the order for 171 Siemens 7MW turbines for its 1.2GW Hornsea Project One site in the UK's North Sea. Lower production and installation costs also contributed to the increase in revenue, the firm said. There was also an increase in profits in Q2 compared to Q1, when Siemens reported a €51 million intake. Overall, the Siemens group reported a 5% increase in revenue from €18.1 billion to €19 billion.